Lehenga cholis are an integral part of Indian ethnic wear. You can still spot women from far off Indian villages wearing this garment on regular basis. It is a high indicator of comfort level, which this outfit promises. Designer lehenga cholis are a special kind of garment that is made with high precision. Designers, who are engaged in the task of designing these clothes are trained and well informed. They are well aware of the current trends and put in hard work to create every garment. For this reason, in the market, there is always a high demand of designer attire. How to make sure that a lehenga choli will suit my body type? You must have seen mermaids in animation. Just as the lower body of a mermaid has impressive curvatures, the lehenga also has similar curves. This style beautifully enhances body contours and bestows the wearer with a slender look. Hence, without making any effort, you can look taller by wearing this dress. Mostly, a backless choli works best, which further highlights a slimmer appearance. You could also for a choli with cap sleeves. A dupatta makes for a stylish appeal with this garment. Usually, you should not pin it. Drape it in a casual way and enjoy the attention of all. It is perhaps the most traditional form of lehenga. From the waist until the hem, the outfit has a parallel cut. This form suits those body types that are on the slim side. This style accentuates curves elegantly and also adds an illusion of height. By wearing medium-sized heels with them, you can conveniently look much taller than you actually are. For the choli, you should go for a sleeveless option. The bare arm look is in vogue and most actresses have been seen sporting it with confidence. Not many women prefer to take a dupatta with it. However, if you do want one, you could drape it in the traditional way that is, around the neck. These lehengas are very popular because of their figure hugging features. Irrespective of your measurements, if you are slimmer than you prefer to be, you could choose this cut. It will add several inches to your curves and help you achieve a full-figure look. This designer outfit has a subtle flair that enchants every body type. You will also find hemlines in a variety of styles. The scalloped looked is very much in demand and also adds a touch of glamor to the entire dress. You can wear 3-quarter sleeve choli or a noodle-strap choli with it. Where can I wear designer lehenga choli? You can wear this gorgeous attire anywhere you want. With a wide variety of functions taking place every month, a designer wear can help you look classy and feel like a diva at the same time. Most popular events where you can sport this dress include weddings, receptions, engagement parties, cultural gatherings, evening parties, daytime pujas, home warming parties, etc. Is age a restriction when you wish to wear designer lehenga choli? Not at all. No matter how old you are, you can don this outfit without any apprehension. Its best feature is that you will find it in a host of designs and kinds. Embellishments used in these garments vary from being rich to austere. Moreover, the colors chosen for these designer clothes are not limited to a certain category. You will find these outfits in traditional colors like sunflower yellows, rose reds, sky blues, sea greens, etc. Similarly, many new designers introduce new kinds of colors in their creations by adding peppy shades like florescent green, shocking pink, electric blue and so on. When you wish to see a varied collection of designer attire, you should visit YOSARI. This online place has designer dresses of high quality with reasonable price tags. 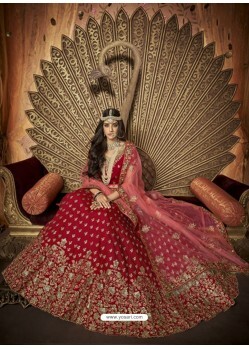 As for the decorations, designers choose different items to decorate the lehenga and the choli. You will be enthralled to see beadwork, beautiful net designs, and embroidery on them. Some designer wear also feature zari work, zardosi work, gold wire work on them. From where can you buy designer lehenga choli? Only online shopping can add fun and satisfaction to your shopping experience. You will not have to spend time in looking for shops that sell designer lehenga cholis because a host of websites sells them at affordable rates. One such website is yosari.com. It is a highly convenient shopping site, which has a big collection of designer wear. Not many websites will present such a wide selection of garments as much as we do. The authenticity of our designer wear is evident from the fact that we have full-time designers working for us. That is why whatever designs you see on the website they are 100% original. Choose any design and be confident that you are wearing a highly stylish outfit from the house of YOSARI. Our delivery range is vast. We ship all our products to India as well as to countries like Canada, Australia, USA, and UK. Moreover, YOSARI has the splendid 14-day return guarantee for each of its customer. Any customer, if he finds the item to be short of his expectations, he could return it within 14 days and get his money back from us. Therefore, you can shop with us without any fear.